We are mfg, in brass & aluminum pressure die casting component mfg. We make as per your sample. 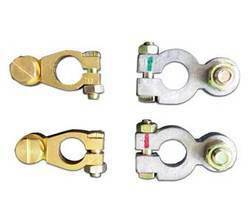 With our expertise and trustworthiness, we are engaged in offering an optimum quality range of Battery Clamps. With wealthy enterprise ride & knowledge, we have been able to supply the exceptional array of Battery Clamp. We have highly acknowledged organization engaged in presenting a remarkable range of Battery Clamp. We are recognized as one of the foremost names in the market, affianced in providing highly qualitative Battery Clamp to our valued clients. Haeger supplied at dual-bowl and dual-shuttle equipped WindowTouch. The two lower tools are mounted on the Turret Tool. Fastener Detection system ensures a fastener is always in place during the insertion stroke. The part program on the InsertionLogic equipped computer ensures that the proper insertion force is exerted on each fastener. With rich industry experience & knowledge, we have been able to provide the best array of Battery Clamps.